Immediately after you’ve won ACCME accreditation, you’ll need to begin preparing for your next big challenge: reaccreditation. That’s because CME providers are required to submit years of performance-in-practice data along with detailed narratives describing past and current learner outcomes, among other information. 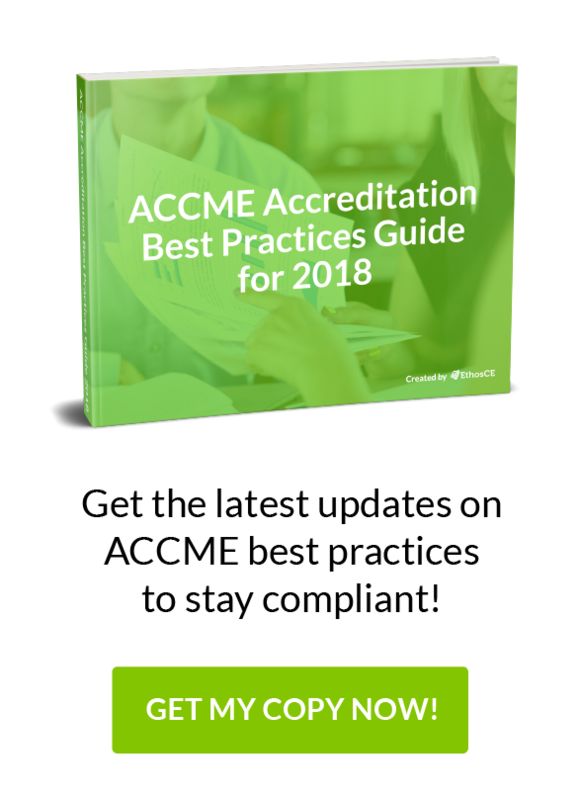 Determining ACCME criteria for reaccreditation is key to developing your long-term plan to maintain compliance. In this post, we’ll show you the criterion relevant to your reaccreditation application and offer some tips to make the preparation process more manageable. The success or failure of your application will be based on the quality of your data. You’ll be asked to provide evidence your CME program remains in compliance with ACCME criteria and requirements for initial accreditation, along with projections of how it will continue to do so in the future. You’ll also be required to show you’ve made significant progress towards fulfilling your CME mission, despite any challenges that your association may have faced. The main thing to keep in mind is that by the time you submit your reaccreditation application, you will have much more performance-in-practice information than when you first applied for accreditation. Your ability to maintain and analyze critical data regarding your program’s operations will be the principal determinant of the strength of your Self-Study Report. Persistent failures to meet certain projected learner outcomes will be especially glaring if data about your program’s successes (and the challenges you’ve overcome) are incomplete. Unlike EthosCE—If your CME management platform doesn’t streamline the data collection and the Program and Activity Reporting System (PARS) submission process, then you’ll face a formidable challenge in building a strong, data-driven narrative. Before we dive more deeply into the application process, let’s take a look the criterion ACCME uses to determine your eligibility for reaccreditation. Criterion 1: Submit a CME mission statement that includes expected results regarding positive changes in learner competence, performance, or patient outcomes as a result of their participation in the program. Criterion 2: Tailor CME activities to meet the unique educational needs (knowledge, competence, or performance) of their learners which cause professional practice gaps. Criterion 3: Create activities and educational interventions that are aligned with the learner outcome, competency, and performance-in-practice goals stated in the provider’s mission statement. Criterion 4: This criterion has been eliminated effective February 2014. Criterion 5: Select educational formats that are appropriate to the setting and desired results of activities. Criterion 6: Develop activities and educational interventions within the context of desired physician attributes. [e.g., Institute of Medicine (IOM) competencies, Accreditation Council for Graduate Medical Education (ACGME) Competencies]. Criterion 7: Design activities and educational interventions independent of the influence of commercial interests. (SCS 1, 2, and 6). Criterion 8: Appropriately manage commercial support (if applicable, SCS 3 of the ACCME Standards for Commercial SupportSM). Criterion 9: Separate promotion from education (SCS 4). Criterion 10: Promote improvements in the quality of healthcare and NOT proprietary interests of a commercial interest (SCS 5). Criterion 11: Analyze changes in learners (competence, performance, or patient outcomes) achieved as a result of their participation in CME programming. Criterion 12: Compile data and complete a program-based analysis to determine what portion of the CME mission has was achieved. Criterion 13: Discover and put into practice the changes necessary in the administration and overall educational design of the CME program to meet the CME mission. Now, let’s look at the reaccreditation process and some tips to strengthen your application. Don’t omit any critical facts in an effort to gloss over any missed benchmarks. Instead, be sure to highlight the obstacles your association overcame and what you’ve learned in the process about how to maintain compliance in challenging circumstances. Be mindful of Health Insurance Portability and Accountability Act (HIPAA) regulations. Any documents you provide to ACCME must not include individually identifiable health information. That means you’ll need to be meticulous in reviewing your submissions for data that could be interpreted as noncompliant with HIPAA standards. Keep detailed records of your CME activity planning and presentation process. ACCME criteria requires you to maintain this documentation during the current accreditation term or for the last twelve months, whichever is longer. Have a rock-solid CME platform. The ACCME will pick up to 15 activities from your current accreditation term and ask you to demonstrate how they comply with the ACCME’s Accreditation Criteria and Policies. That means you’ll need to maintain exhaustive data on all of your CME activities starting from the date of your initial accreditation. The right CME platform will automate LMS data collection, removing the possibility your Self-Study Report will miss information that could potentially strengthen your application. The EthosCE platform manages PARS submissions and LMS data collection for your CME program—allowing your organization to focus on developing the Self-Study Report and preparing for your reaccreditation interviews. The reaccreditation application process will, despite its many challenges, help you develop a clear picture of your association’s resilience in fulfilling your CME mission. You’ll need to optimize your time and resources to present a narrative to ACCME that reflects your program’s unique contribution to the quality of CME as a whole. At EthosCE, we work with associations of every size during the reaccreditation process. Our LMS and CME data management services allow you to automate time-consuming tasks and concentrate on providing exceptional learning experiences for your members. Connect with us to learn how we can help you meet your goals. How To Use Your LMS to Improve CME Seminar Administration Curious What a Med CE Designed LMS Can Do for You?